Lava, whether hot or cold, is a wonderful and fun thing. We never tire of visiting the flow and the land is never the same thing two visits in a row. So many times, where we stood the previous day is now buried in new layers of rock. The active flow is one of the few places where you can stand on land and know you are the first creature in the world to do so. 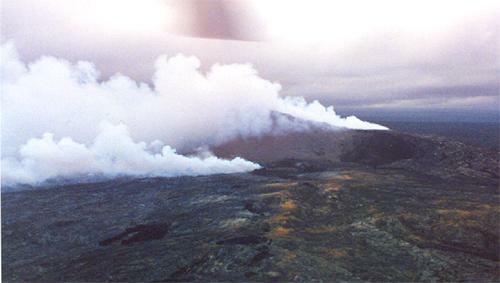 Normally magma flows from the Pu'u 'O'o vent, 7 or so miles from the ocean and 3,000 feet above sea level through a series of lava tubes to the ocean. 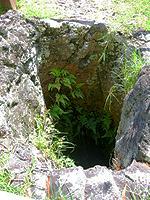 Often a lava tube will collapse or have an obstruction causing the 2000°F liquid rock to find an alternative route. 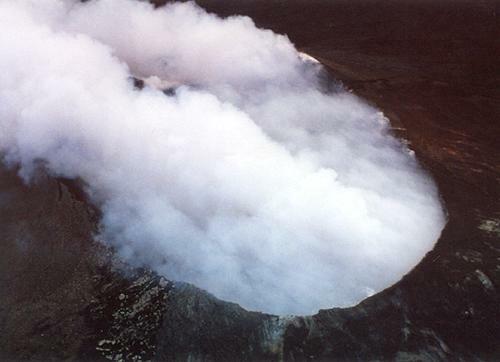 Usually any alternative route eventually leads to the surface where the liquid lava breaks through the ground and forms pools and rivers of lava. 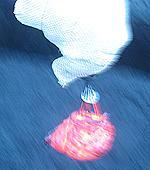 Surface flows are wonderful because they are fairly safe and offer fantastic photographic opportunities. Some of the pictures on this page were taken by John Alexander of Dolphin Bay Hotel. A small flow breaks through solid rock. Dull red of cooling lava. Older pahoehoe pushed up by liquid rock. 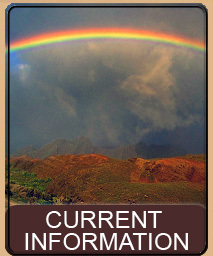 Flow upon flow makes new ground. 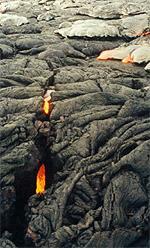 Lava flows through an older fissure. A small river of lava. Same river a few minutes later. The pressure from the liquid rock flowing from the vent causes cold surface rock to break and be pushed up and on end. 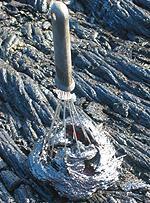 A cooling flow around ropey pahoehoe. Bright red lava breaks from a fresh flow. A small lava pond has nowhere to go. New flows break from older flows. 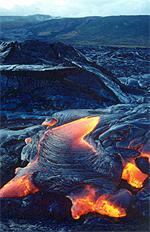 A lava pond forms on fairly level ground. 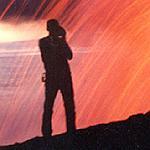 Lava photographer David Boyle grabs the moment. Another fluid flow ponds near its source. Pressure breaks the cold rock allowing the liquid through. Ropey pahoehoe is being created by obstructions at the base of this flow. 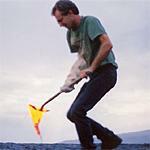 When the magma from the Pu'u 'O'o vent, 7 or so miles from the ocean and 3,000 feet above sea level, finally reaches the ocean the result is a combination of explosions, steam and 2,000°F liquid rock hitting cold ocean water. 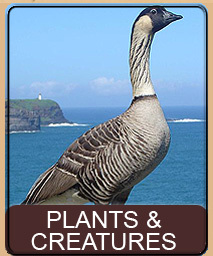 A very dangerous place, the ocean entry produces and looses hundreds of acres of new land each year. Ocean entry steam plume with helicopter. 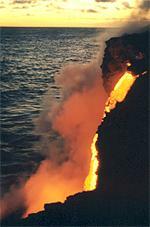 Lava pours down a cliff and into the ocean. Same flow later at night after sunset. Another helicopter and steam plume view. 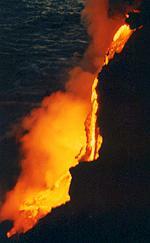 Lava comes down the cliff as a firehose of lava squirts into the ocean. 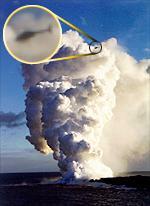 A Lava Firehose is created when presure of lava through a small hole cause it to spout like a firehose, as seen in this blowup. Rivers of lava pour down the cliff within a few feet of us. A small bench collapse caught at the exact moment the top of the bench breaks open exposing the lava. Lava explodes violently as this flow hits the cold ocean water. Another huge explosion sends liquid rock flying into the air. We are about 20 yards from this explosion. was captured by InstantHawaii team member John Alexander of Dolphin Bay Hotel. 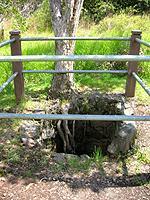 Skylights are caused by the collapse of a portion of a lava tube roof. The collapse can be caused by a surge of lava hitting the roof, or the constant expansion and contraction of the heated rock, or even by earthquakes. Active skylights, while very dangerous, are beautiful to behold. You can peer into the skylight and, after your eyes adjust to the searing yellow, you can see the river of lava surging below. Removing a sample from a skylight. Note the aircraft cable is on fire. Skylight closeup. Note our sample is now stuck in the rock and burning. Look carefully and you can see a slightly brighter portion of lava on the left. 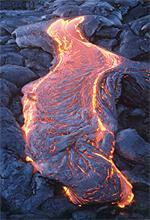 That is the river of lava. Closeup into a skylight. Note the red hot rocks in the tube itself. An active flow surges through a thin skylight for photographers. Skylight as seen from a helicopter. Another skylight seen from a helicopter. Lava can be fun and educational... but at all times lava is ALWAYS dangerous. 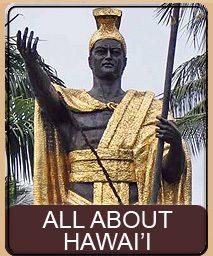 Make sure you read our Lava Cautions and Warnings page before trying anything you read or see in this site. Just about anything can be done with lava... from making sculptures to cooking food, lava is useful, versatile and entertaining. 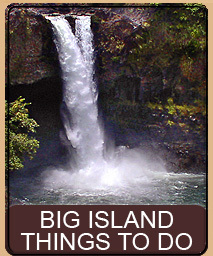 Keeping in mind that some activities require you to be out of the Hawai'i Volcanoes National Park boundary, so you don't get nabbed by rangers, all the activities require caution, planning and the proper equipment. Do not try this at home... we are professional idiots. A photographer is in a seemingly impossible, but beautiful place for this shot. John positions for this dangerous shot at the ocean entry. Sunrise gives a special light at the ocean entry. 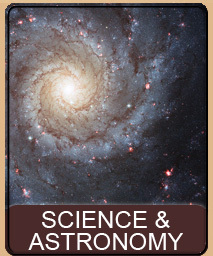 John Alexandar and David Boyle overlook a brand new hot breakout. 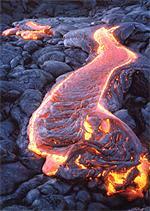 Most people freak out when they see molten lava in the cracks below their feet - but really it is fairly safe. How close do you want to get? 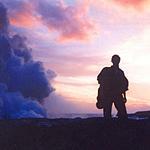 The lava flow in Hawai'i lets you get closer than just about anywhere else in the world. Wrap the chicken in at least 10 Ti leaves. Get a good shovel full of 2000°F lava. Put the Ti wrapped chicken onto the shovel full of lava. Get another shovel full of lava. Cover the chicken with the second shovel full. It helps to have a hole for steam to escape else the chicken can explode. Let the chicken cook for at least 45 minutes in the lava rock oven. To get at the chicken simply crack the rock oven with your shovel. It will easily break open. Remove the charred Ti leaves and cut into the tasty chicken. Finding a good liquid flow you give the kitchen whisk a few good spins. Dip the kitchen whisk, and then dip it again - a classic double dip. Once you dip flatten the underside by pressing down on the cold lava ground. 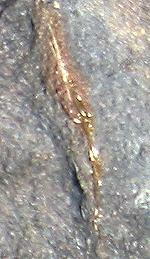 A perfect double dipped whisk with a nice flat bottom. The cooling whisk is still hot for about 30 to 40 minutes after dipping. Picking up lava with a gloved hand can be dangerous. 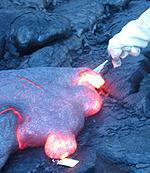 Notice the lava stuck to the quickly retreating glove. 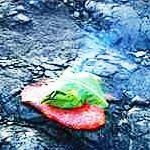 Gifts given to the Goddess Pele include cigarettes and gin. These photos show a gift of gin being consumed by the Goddess. Bottle gin is placed on the flow. Bottle heating up and merging. Parking as close as we can get to Lava. Notice the roads still visible in the destroyed Royal Garden Subdivision. 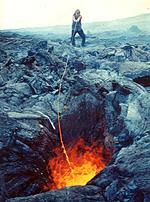 The lava is currently flowing through the ground under Kilauea to its Pu'u 'O'o vent. At the vent it comes to the surface briefly before plunging through a series of lava tubes as it heads towards the ocean. 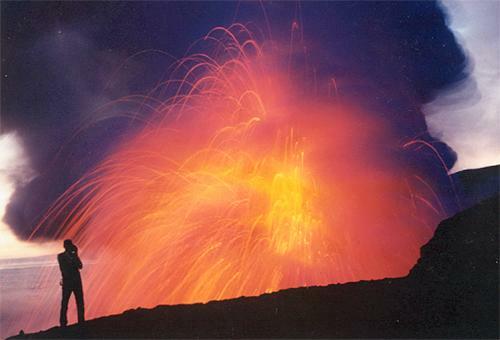 Pu'u 'O'o sits at about 3,000 feet above sea level and is about 7 miles from the ocean. It is in a very remote area and is accessible only by overnight hiking or helicopter tours. Pu'u 'O'o as seen from the top of the pali at the active flow. Pu'u 'O'o as seen from Glenwood Road between Hilo and Volcano. 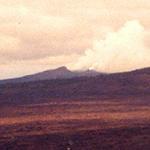 Pu'u 'O'o as seen from Kalapana in lower Puna district. Approaching Pu'u 'O'o by helicoptor. The main vent is on the right with a smaller side vent on the left. 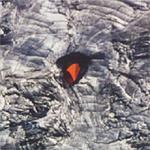 Hovering directly over Pu'u 'O'o main vent - scary. 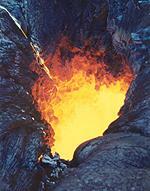 Pele's Tears are created when a fissure or cone fountains molten lava high into the air. 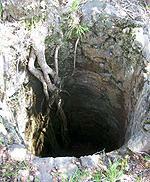 The small pieces of liquid rock turn into round, oval and tear shaped rock as they fall back to earth. Small oval and round Pele's Tears. InstantHawaii team member Debi looks for Pele's Tears. 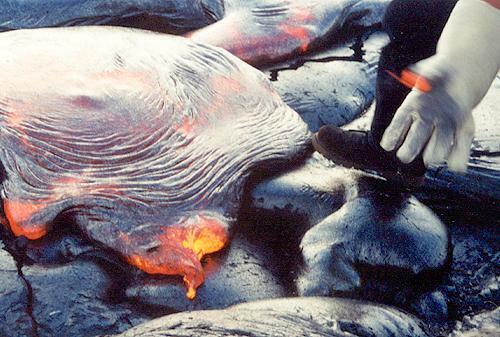 Lava bombs are the big version of Pele's Tears. 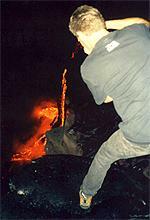 Large fountaining eruptions can hurl big pieces of liquid rock high into the air. These pieces cool on the way down and land as round and oval rocks. 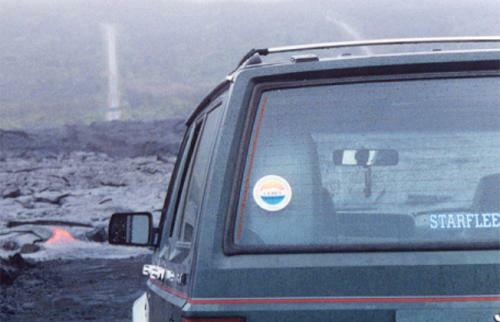 Lava Bombs can be anywhere from a few inches in size to the size of a car. 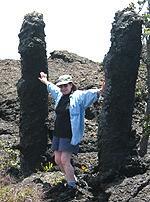 This lava bomb is about 2 feet wide and a 8 inches thick. Driving by a Lava Bomb on Mauna Kea upper road. Lava Bombs are everywhere on Mauna Kea upper road. 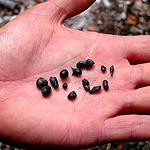 The upper road around Mauna Kea, at about 9,000 feet, has many lava bombs scattered about. 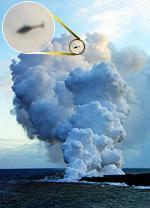 Pele's Hair is formed when lava fountains into the air during a fairly strong wind. The wind will extrude a very thin long hair of lava from the molten blob. These thin hairs are about the thickness of human hair and can be anywhere from a few inches to more than a foot in length. Because the molten lava is stretched very thin and instantly cooled the hair is a bright golden-greenish hue. 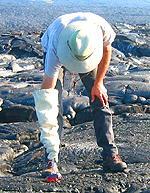 You can find Pele's hair collected in corners and groves of old lava flows around the ocean entry and other places where fountaining has occurred. Pele's Hair collects around rocks. Very sharp and brittle, but also beautiful. 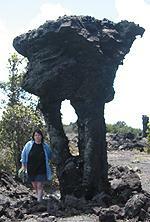 Lava Trees are created when fountains of molten lava come down and coat living trees. The temperature of the lava burns the tree completely away leaving a hollow rock replica of the tree standing where the tree once stood. John inspects a large tree. Hollow inside of a Lava Tree. Cluster of trees, now coated in rock. Very straight rock where a tree once stood. 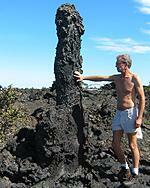 This Lava Tree still has the burnt wood. Debi with two tree cluster. Tree Molds are the opposite of Lava Trees. 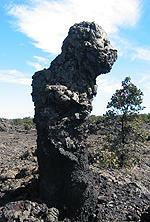 Whereas a Lava Tree is created when a living tree is coated with fountaining lava, a Tree Mold is created when a lava flow fills an area with lava. 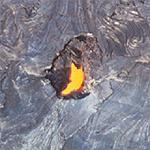 When lava enters an area it can often raise the ground level - sometimes as high as 20 or 30 feet. Trees growing in such an area are quickly covered with lava. 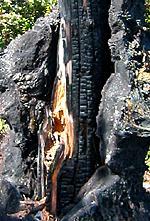 The lava touching the tree causes the tree to burn out, leaving a mold where the tree once was. Looking into a tree mold, the bottom of the mold shows where the old ground level used to be. A Tree Mold flush with the ground. John inspects a Tree Mold. A deep round Tree Mold. Inside of a mold shows imprint of bark. This old Tree Mold is supporting life. A new tree grows into an old mold. Another shot of the mold. Shatter Rings are interesting geological formations that are usually huge ellipses or concentric circles of broken lava. 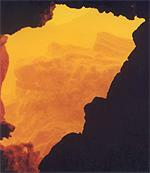 Often with sheer vertical walls 25 to 30 feet tall these rings of lava appear over active lava tubes. These start out as a collapsed tumulus with an unstable lava flow within. The unstable flow causes the roof to constantly flex creating concentric circles and massive fracturing of the rock. These circles of rock are often 50 to 100 feet in diameter. Shatter Ring above the pali viewed from a helicopter. 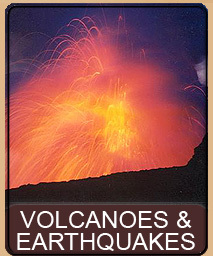 This page is named 'Volcano.gallery'. Can't Find It?